This print is a high quality giclee printed on heavy watercolor paper, with an edition side of 50 prints. The edition is hand signed and numbered and is available for $65.00 loose and $85.00 matted. These tulips are part of my broken or Rembrandt Tulip collection that focuses on the heirloom varieties. 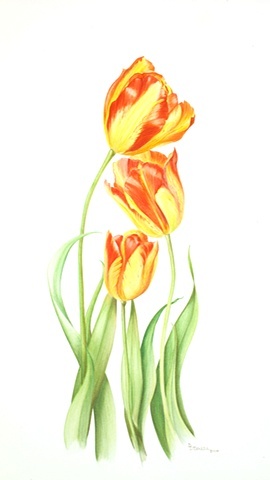 The original watercolor is titled "Tulipa Princess Margaret Rose" was featured on the Phoenix Art Museum website in Oct. 2009.